Time to reveal some more monsters! Meet Squeem, Crabcano, and Smoglin! Look at Crabcano go! He’s so adorably mad that you just kind of want to give him a hug and tell him to calm down – don’t do that though, because he will spit fiery rocks at you. This means that all of the monsters in this image have been revealed – but no worries! 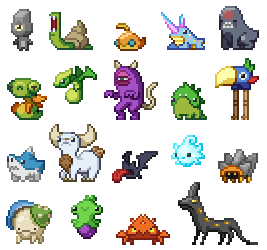 There are still plenty of monsters we’ve yet to show off. In other news, Erick Scarecrow/ESCToy has just announced a new stretch goal for their Penguin Plush Kickstarter! Many of you are already familiar with the Shockhopper Mk I Mech and Penguin Tank as in-game enemies! They’d probably look even cooler if your characters were driving them. 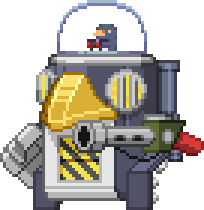 Because we’re so excited at the prospect of seeing Starbound’s penguins out in the world in cuddly plush form, if Erick’s Kickstarter reaches $55k, we’ve agreed to make the Penguin Tank and Penguin Mech available as in-game vehicles! You can check out ESCToy’s Penguin Plush Kickstarter here.